Quick backstory: My mother-in-law is The Queen (La Reina) of Mexican home cooking. She adapted her traditional Mexican rice recipe for my daughter, who didn’t care for the chopped onions and carrots in her dish. However, she couldn’t adapt it enough to keep it gluten-free, so when my girl told me she missed her “Abuelita’s Rice,” I thought I’d tackle a GF version. My daughter not only told me I nailed it, but she has 2 bowls for breakfast every single day and has named it, “Mommy’s Rice.” Because I can’t seem to nail, though, a double or triple batch (why is that? ), I make one batch about every-other-day. I need to save time, as does most of the world, so I have some shortcuts that don’t seem like much (read: easy), but it really does help streamline the whole process. I do not use the optional onion and carrot, but I’ve added it here for those without a phobia of those veggies. Gather up ingredients. Get the 1 cup and 1/4 cup measuring cups filled up with the rice and have it next to the stove, and get out a wide skillet that you have a proper lid for. 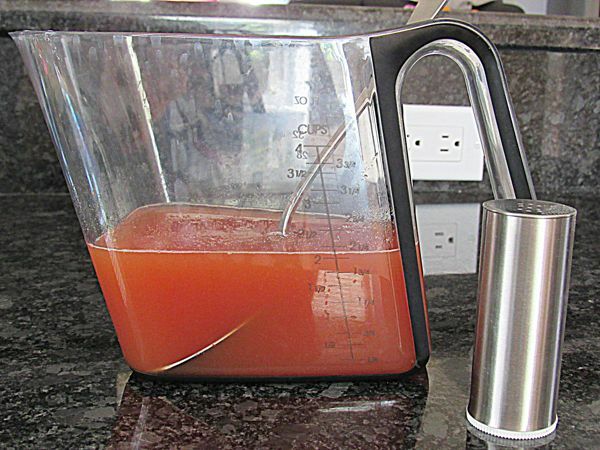 Since you are measuring 2 liquids (stock and tomato sauce) and the original recipe I used had me first measuring tomato sauce and then chicken stock, I save time by adding them together. I stir it all up to keep any of the tomato sauce from sticking. Another time-saver I do here is add the salt to the liquid. Stir until salt is dissolved. It saves me from scurrying to get the garlic AND salt added when that tiny window opens to add them and the rice can turn from being golden to burnt. Bonus: I don’t need to salt it for my kiddo when it’s done. Put 3 tablespoons of oil into the pan an set at medium-high (just past the half-way mark on the knob) to get the oil good and hot. If you are using onion and carrot, add this now–stir every minute or so for a couple of minutes. Next, or first if you’re not using veggies, pour the 1 and 1/4 rice and stir to coat in oil. 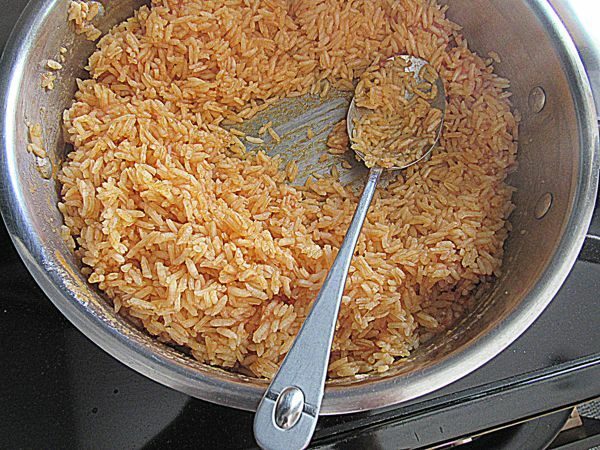 Spread the rice evenly along the bottom of the pan, then stir after about 30 seconds and smooth it back to even. Keep repeating that until you see that the rice is becoming more opaque. When you see that, add the garlic and stir continually until you seem some very faint golden coloring. Next add the liquid gold: the combo of stock, sauce and salt. You’ll get a loud hissing sizzle when the liquid hits the pan. Make sure you scrape down all the stray bits on the side and wait for a nice strong boil. 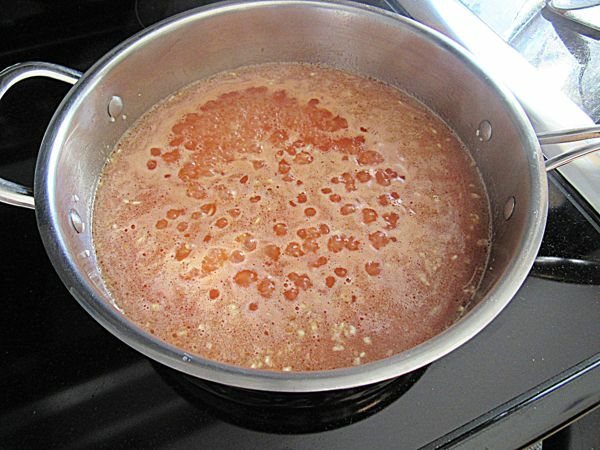 Once the liquid is bubbling rapidly, put the lid on, turn the heat to low and set the timer for 17 minutes. 17 is the magic number for my stove (I have an electric stove), but you’ll have to see what yours is. I’d check after 15…don’t lift the lid, but if it looks like all of the liquid is gone, or if you smell some charring, grab a pot holder and spoon and dig to the bottom in the center. Grab a few kernels to test, also. Your rice will be ready if the liquid is absorbed/gone and the rice is the teeniest bit al dente–just a little tiny bit under. (If it’s more than slightly under, add about 1/4 cup more chicken stock and replace lid for 3-5 more minutes.) This is my last magic trick. Stir completely; you’ll have some of the tomato mixture along the side of the entire pan (see pic), so you want to mix everything well so it’s evenly flavored. Then put the lid back on and set the pan on a cool burner for about 10 more minutes. The heat and steam the rice is still dispersing will continue to cook the rice without that horrible scalding on the bottom of the pan (my former nemesis). You can top with cilantro (or not), homemade salsa (I’ll have a recipe for the house favorite), or just eat it out of a bowl for breakfast every morning like my girl. If you’re sharing, this will be a side for about 4. Otherwise, it’s the 8-year-old’s stash and you need to ask if you are allowed to have some. 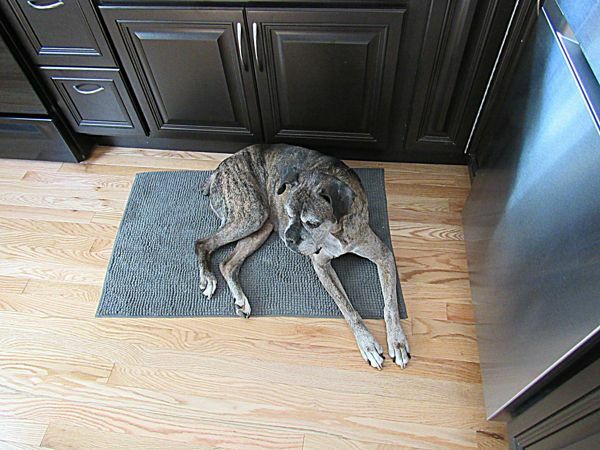 I also recommend having a loyal kitchen partner to keep you company (and keep your floors clean of any dropped food). Prep ingredients and get the rice measured out and next to stove. Measure 4 oz tomato sauce and add 14 oz chicken stock to that, stirring well to blend. Add salt to taste to this mixture. Add 3 tablespoons of oil to your pan and heat on medium/high. If you are using optional onion and carrot, add to oil and stir. Add 1.25 cups of rice and stir until all is coated with oil. Add more rice if needed. 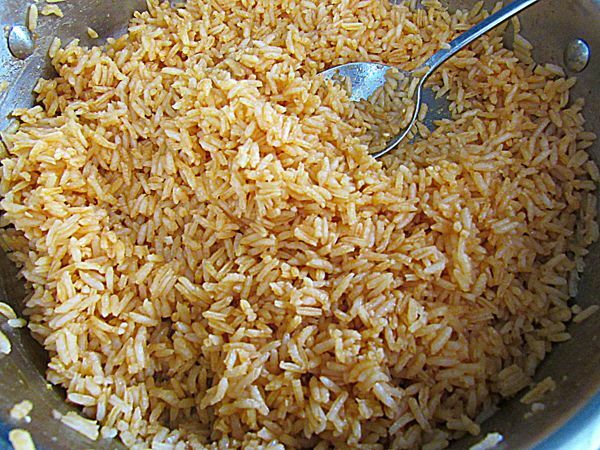 Spread rice evenly in pan and let cook, stirring and spreading again every 30-45 seconds. Once rice is no longer translucent and is bright white, turning very light golden, add garlic and stir. Next, pour in the liquid. 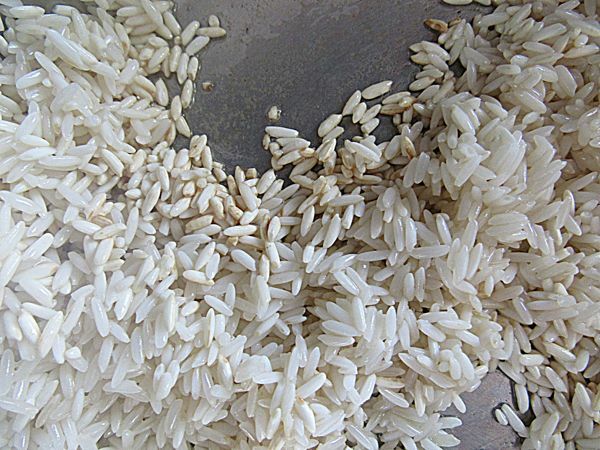 Scrape down any rice from the sides of the pan, even out rice and bring to a boil. Once liquid is boiling, put the lid on, turn the head to low, and set timer to check in 15 minutes. 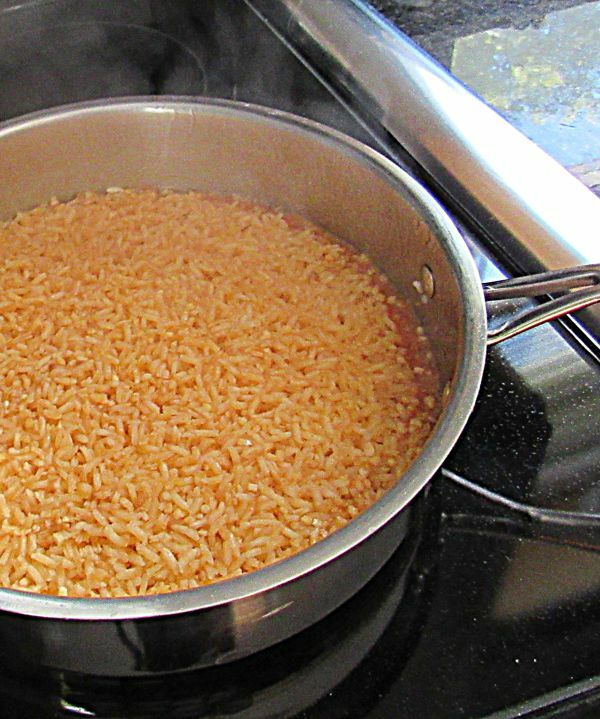 Rice is ready when liquid is absorbed and very slightly al dente. If this is where you are at, stir completely, put the lid back on, and set aside off-burner to continue to steam. If the rice is more than slightly under and the liquid has been absorbed, add a bit more stock and cook for another 3-5 minutes, then set aside to steam off-burner with the lid on for about 15 minutes. Sounds tasty! Just out of curiosity, what is in your’ mother-in-law’s version that contains gluten? Hi Pat–thanks! She uses chicken broth and bullion that are not gluten free.